The True North Salmon Company has selected FleishmanHillard as its AOR following a competitive review involving five agencies. BLACKS HARBOUR, NEW BRUNSWICK: The True North Salmon Company has selected FleishmanHillard as its AOR following a competitive review involving five agencies. True North, which produces naturally raised, farmed Atlantic salmon for the US and Canada, chose Fleishman because of the agency’s "breadth of services" and experience in building consumer awareness for brands, explained FoodPop president Steve Yevoli. FoodPop, True North’s marketing partner, was tasked with identifying agencies for the RFP, and selecting one that could best help the company with its brand-building efforts. As True North’s first PR AOR, Fleishman will promote the company to media outlets and introduce it as "the first consumer brand in the fresh seafood category," said Yevoli. The company already has a strong presence in the b-to-b space. Fleishman’s other tasks include fine-tuning True North’s messaging, creating relationships with influencers, and crafting a narrative about what the brand represents in the food and wellness space, said Bill Power, senior partner and MD of the agency’s global brand marketing practice. The agency, which began working on the account at the end of February, will engage a range of consumer lifestyle and health and nutrition media. Initially, the firm will focus on the Northeast region of the US, and then broaden its reach nationally. Yevoli said the company’s main brand-building goal is to have consumers go to a grocery store and ask for True North Salmon by name when they are buying fish. Power said "now is the perfect time for a brand like this" since US consumers’ views on food are increasingly turning toward quality, health, and nutritional attributes. 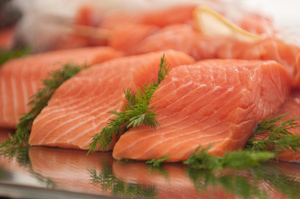 Industry experts have been telling consumers to avoid farmed salmon for years because they are less nutritious than wild salmon and the farms pollute the ocean. However, the gap between farmed and wild has been closing as salmon farmers begin making their aquaculture methods more sustainable.